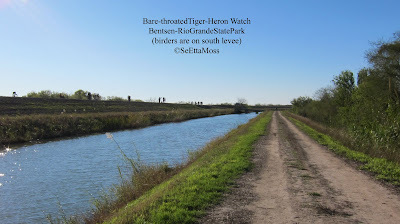 I was hoping to get some video of the Bentsen Tiger-Heron so walked out on the levee south of the Bentsen-Rio Grande State Park a little before 4 pm today and the top pic is what I saw. The south levee is on the left where the birders are standing--it is higher and affords better views. The trail on the north levee is directly ahead and some of the vegetation on the north side of the cnal in the park's re-veg area is visible on the far right. Over the next hour or so a lot more birders arrived increasing to about 50 at the most. I found these two good videos of BARE-THROATED TIGER-HERONS videotaped in Costa Rica by different persons. The top video by "doctorpyserphd" shows two BARE-THROATED TIGER-HERON engaged in probable courtship behavior in Tortuguero Natl Park, Costa Rica according to the labels. The bottom video shows a single BARE-THROATED TIGER-HERON videotaped in Corcovado Natl Park, Costa Rica, that is engaged in grooming and foraging behavior. 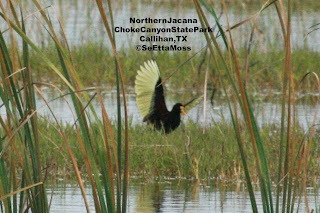 I found this image on the on the internet at PackerLight.com and found it helpful in visualizing the BARE-THROATED TIGER-HERON photo I posted just below, and re-posted above this pic, as it shows the upper wings including the interesting trailing edge that appears scalloped due to the rounded feather ends. I emailed the photographer, Michael Packer, for permission to post this pic on my blog and he promptly replied authorizing my request (I strongly encourage seeking permission before using someone's photographic work--it's like borrowing someone's book without asking). This really pretty cool pic of the BARE-THROATED TIGER-HERON was buried just to left of the middle of the uncropped pic below. 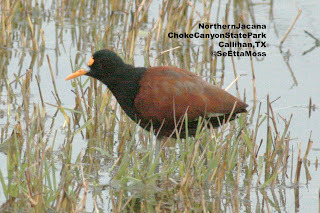 Look carefully--it is flying to the left into the thick vegetation that surrounds the pond on the south side of the canal and the top of it's wing is far to the left of (and in line with) the 2nd line of text. 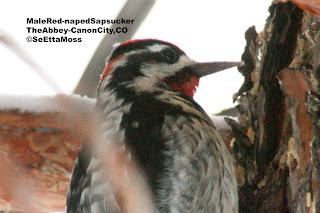 The banding on it's tail is visible in the center bottom of the pic and it's legs show directly to the right of the tail. This shows the beautiful what-looks-like-fringing on the trailing edge of the wings (could this what is called the "vermiculated" wing plumage???). 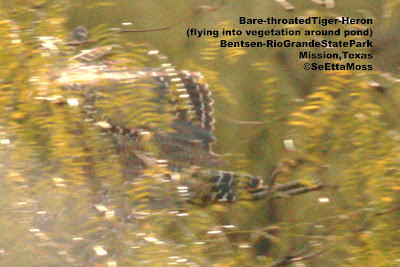 These are the next 3 pics in the sequence of photos I took during the 2nd flight of the BARE-THROATED TIGER-HERON. 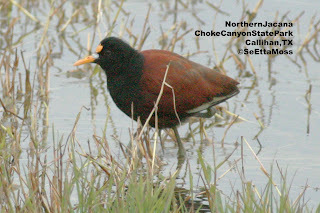 The bird was well past us in these pics but still going to the left. It was starting to descend to land on the south side of the canal. 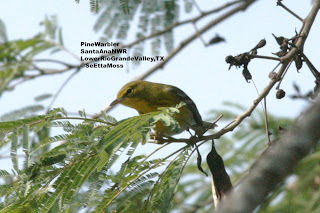 The bottom pic shows the bird just before it went into the trees in the re-vegetation area which is west of the Bentsen-Rio Grande State Park buildings and volunteer camping area. 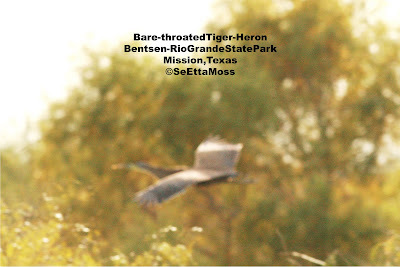 This is part of a series of pics I took during the 2nd flight of the BARE-THROATED TIGER-HERON this afternoon. Each of these pics was taken sequentially (and ordered on this post in the order taken) in less than a minute per the time stamp from my camera (I was shooting as fast as I could). 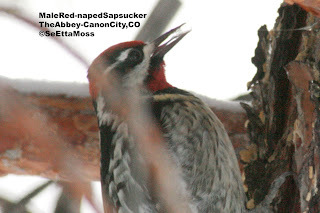 Though the bottom pics appear larger they were actually a little more distant and the illusion is due to my cropping the pics as quick as I could while trying to make sure they accurately reflect the bird. 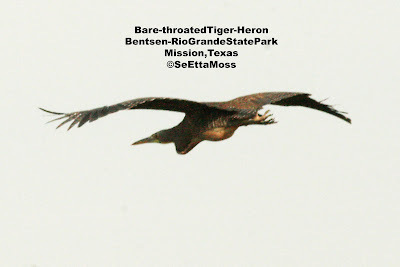 Tonight on my third try to see the probable first U.S. record Bare-throated Tiger-Heron, it appeared. Unfortunately it was almost dark and the photo I took did not come out. 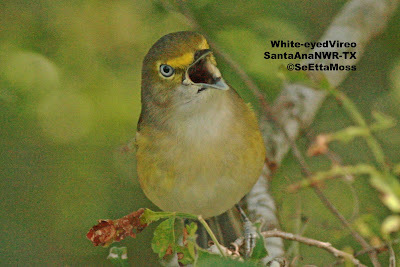 As it was getting dark, several of the birders who had been watching for it for hours were leaving and did not see it. 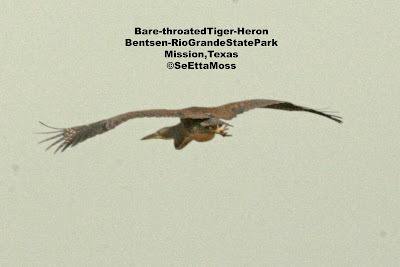 Today I spent some hours with many other birders watching for a super rarity--a Bare-throated Tiger-Heron that was found last night near Bentsen-Rio Grande State Park in Mission,TX. 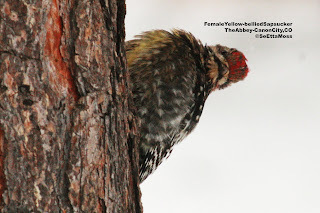 I didnt' see this vagrant bird from far below the border and only possible sightings by others today. 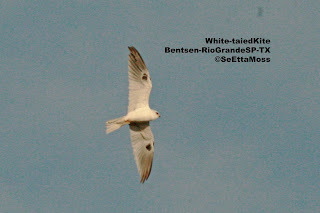 Many of us were entertained by this White-tailed Kite that worked an area nearby. Other pleasant distractions were a Northern Harrier and an eastern Red-tailed Hawk. 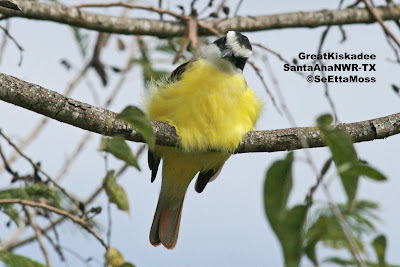 Fortunately the sun had come out by the time I photographed this Great Kiskadee at Santa Ana NWR today. It's bright yellow plumage shows so much better with sunshine. 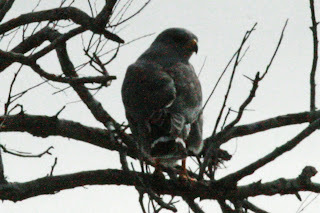 I found this hawk this morning east of the Pintail Lake trail. Unfortunately the tree was perched in a tree well over a hundred feet away (more like 150 feet). Due to that distance, the mostly cloudy sky and my handholding the camera, I had to use a high ISO setting and fast speed so the pics came out pretty dark and I was unable to lighten them any better than as shown without distorting them. The hawk is blackish with a wide white band around the middle of the tail, a narrow white terminal tail band, it has a yellowish cere, wingtips are shorter than tail tip, and it appears to have long legs. These fit the description for a Common Black Hawk. Also it called and retrospectively it sounds like the call of a Common Black Hawk. Finally it shook itself to get some of the water off and it kind of hopped a little further onto the bank from the ice. 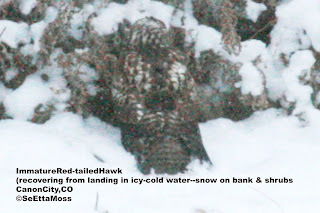 The 3rd pic shows the hawk as it just perched on the bank for a few more minutes. Finally the hawk hopped, with an assist from flapping wings, into the shrubs where I suppose it felt safer. Why this hawk landed in the pond is unknown. Was it chasing some prey that was able to maneuver up from the water? Was it going after, in some desperate attempt to eat, a small duck in the water? 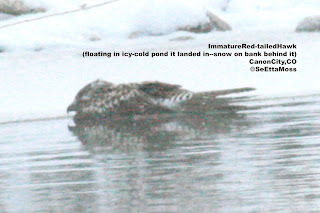 Was there some visual problem (with its eyes, glare from the water) that caused it to undershoot a landing on the ice? I wasn't the only vertebrate interested in what was happening with this hawk as several small ducks swam directly over to it right after it hit the water. They swam away then returned near it when it got up on the ice--like they were also trying to figure out this unusual event. When I stopped to look to see if either of Trumpeter Swans was still around, I caught a glimpse (looking with my binoculars through my windshield as it was around 10 degrees F) of what looked like a hawk flying down into the pond. I jumped out of my car and put my binoculars on something in the water but couldn't quite tell what it was. Since I didn't have my spotting scope with me (I think this is the only time in the past year I left it at home, wouldn't you know), I took a few pics with my digital camera with long lens. What I saw was in the top pic--a hawk floating in the water!! Wow, it just floated like that for several minutes (maybe stunned since it seemed to go down fast? ).